Spotlight Spotlight Business of the Week for 08/21/17 is Centerstone! Spotlight Business of the Week for 08/21/17 is Centerstone! Congratulations to Centerstone, our Carterville Chamber Business of the Week for 08/21/17! Centerstone has been in business for over 60 years. Prior to being known as Centerstone in Southern Illinois, we were The H Group. 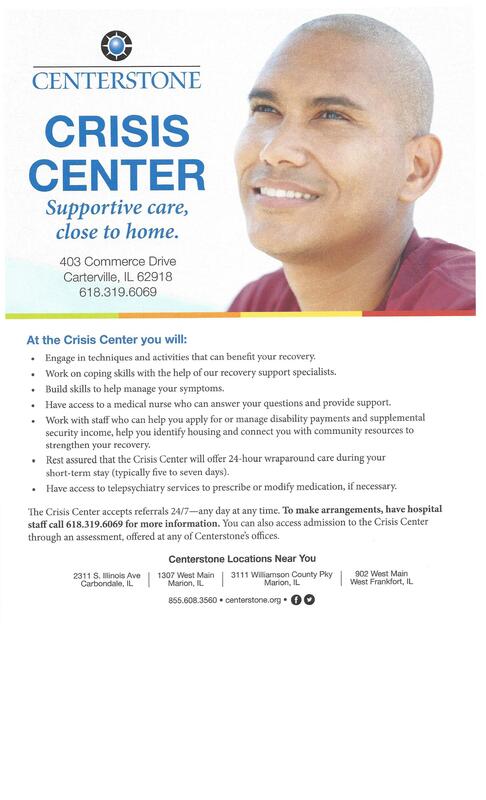 Centerstone is one of the nation’s largest not-for-profit providers of community-based behavioral health care. Nationally we serve more than 170,000 children, adolescents, adults, seniors, and their families each year. We offer a full range of mental health services, substance abuse treatment, and intellectual and developmental disabilities services in Florida, Illinois, Indiana, Kentucky, and Tennessee. In Illinois, we have outpatient offices in Alton, Carbondale, Marion, and West Frankfort. Our Crisis Stabilization Unit is open in Carterville. Our broad range of services is designed to ensure that sensitive, individualized care is available to everyone seeking help. The community stands out in Carterville. We are thankful for the positive relationship and all of the help we receive from the Carterville Police Department. Our school-based services team can’t say more about the level of support received from the Carterville School District. Each day they are able to see families in the schools and in their homes because of the referrals and synergy of the dedicated school counseling staff, faculty, and our family services counselors. We are happy to be a part of a thriving community with a dedication to serving Southern Illinois. Join us for the 17th Annual Bocce Tournament on September 15! Teams of four play from 11 until 5 and it includes a BBQ lunch. Sponsorships are still available as well. The tournament supports our Client Tournament on September 14th and helps enhance and support crucial services to children, adults and families throughout Southern Illinois. See the attachment for more information or contact Kathryn Sime (618-319-4836) or Kathryn.sime@centerstone.org.